One April morning a Rottweiler and a black labrador went into the River Coln at Cutler's Ford and savagely attacked a pair of swans. One flew off, but it's mate, a beautiful young cob, was not so lucky. We were called to the scene and saw the swan with its wing trailing in the water. The swan tried to flap its wings, but only one would respond so we knew that the wing was broken. It was only after having waded into the river to catch the traumatised bird that we realised how bad the injury was. About 15 cm of bone was sticking out of the main wing and it was obvious that the shoulder joint was also not right - in fact there was a break there as well. Imagine the pain this poor swan was in. 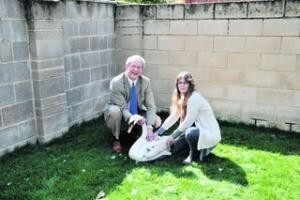 The swan was rushed to our vet, Neil Forbes of Vets Now Referrals in Swindon who was as outraged as us by the dog attack. Neil operated immediately, inserting a metal splint to join the severed bones together. The swan was then looked after by our colleague Sue at the Swan Sanctuary in Swindon. The picure opposite shows the swan with Neil and Sue. Unfortunately the bones did not mend and the decision had to be taken to put the swan to sleep. This should never have happened. The dog owners, Mr and Mrs Lear, were not able to control their dogs. What on earth were they doing owning such dogs? They said that they could not help us with the vet's bill as they were on benefits. The police were informed. The swan being operated on. It was a beautiful sunny day, 26th August. People were out enjoying the countryside and the serene River Thames. Imagine their horror when they saw two black dogs attacking a swan which was out grazing in a field with its mate. One of the three people with the dogs also appeared to hit the swan with a stick. The swan eventually managed to get away, but was covered in blood. Fairford Swan Aid responded to a phone call from the keeper at Buscot Lock and were quickly on the scene. The swan was motionless in the water, obviously in shock, with blood all over its tail. It did not want to come near the bank, but luckily we were able to enlist the help of some passing canoeists who expertly manoeuvred their craft to gently herd the swan in range of our swan hook. We recognised the swan as one we had rescued before when it had crash landed on a road. Its injuries were horrific. 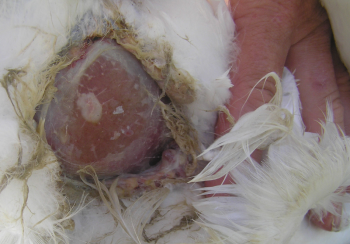 Several bloody bites to its tail had narrowly avoided damaging its oil gland which is needed for preening; there were two holes in its chest, one two and a half inches in diameter where the flesh had been ripped away exposing the breast muscle. Three passing hikers helped us carry the heavy swan to the car and we immediately took it to South West Swan Sanctuary where the wounds were cleaned and antibiotics and pain killers administered. As the swan had only just been attacked there was no time for infection to set in and the swan made a good recovery and eating well. However, this incident should never have happened. In fact it was the second dog attack on a swan in a week as we had rescued another swan from Lechlade two days before with a dog bite under its wing. 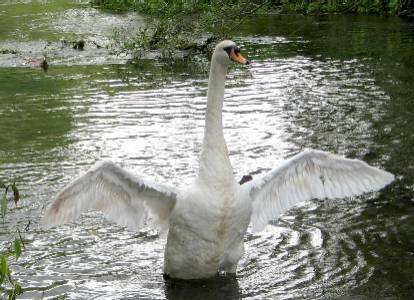 We know of 3 occasions when dogs have attacked swans by the River Coln in Fairford this year. 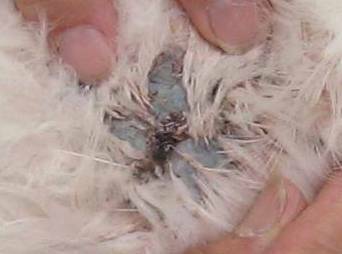 We ask all dog owners who cannot control their dogs to keep them on a lead when near wildlife. Margaret regularly checks the swans at Lechlade and it was on Tuesday 2nd March that she had an unexpected rescue. She was feeding a group of swans when a passing lady pointed out a swan with its leg on its back. This is usually a sign of thermo regulation – swans occasionally take their feet out of the water to warm them up as constant immersion in cold water can have a chilling effect. 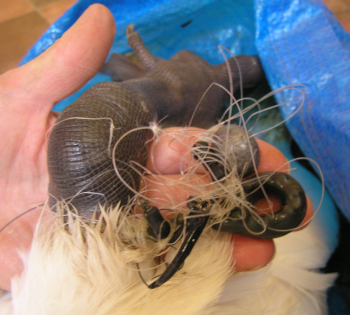 This time, however, it was different – the swan had discarded fishing line bound tightly round its leg and attached to its wing by a triple barbed hook. If left, the line would have got tighter and tighter with the foot eventually falling off if the swan had not died beforehand after a great deal of suffering. Margaret did not have her rescue equipment with her, but managed to grab the swan’s neck from the steep river bank without falling in – always a hazard on swan rescues. 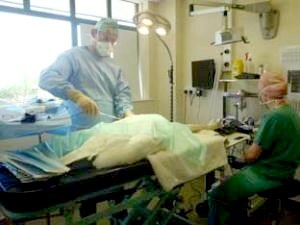 She whisked the swan to our colleague, Sue of South West Swan Sanctuary in Swindon, and the line was removed and a course of a ntibiotics and anti-inflammatories given. Luckily the swan was in good condition before the incident which must have only just happened and made a quick recovery. It was released back to the Thames at Lechlade the following week. This swan was one of the lucky ones. Others suffer for long periods because of the thoughtless actions of people. There are many careful anglers, but unfortunately Lechlade attracts lots of casual fishermen especially at weekends and during school holidays and is a blackspot for swans getting caught up in fishing tackle. We do have people at Lechlade who keep an eye out for sickly swans and inform us as soon as they notice something wrong. This is invaluable and prompt action leads to reduced suffering and improved chances of recovery. At least 2 swans have been shot on the River Coln over the past month. Fairford Swan Aid was notified of a dead swan in mid June. On examination 2 pellet holes were found on the corpse. On Thursday 16th July, an observant member of the public noticed that one of the swans on the river looked as if he had a chunk missing from him. Fairford Swan Aid went down straight away and caught the swan who had blood on him. It turned out he had been shot. He obviously had to be taken away from his mate and he was treated by Sue at South West Swan Rescue in Swindon with antibiotics after an X-ray and consultation with avian specialist vets Great Western Referrals. This cob had already suffered at the hands of vandals this year when he and his mate had all their eggs taken. Thanks to the prompt action of the member of the public he has made a full recovery and was released back to the River on Monday 20th July - see photo below. It is an offence under the Wildlife and Countryside Act to shoot swans and the offender will be prosecuted if caught. See the article in the local paper. See another article about vandalism. Copyright © 2001-2011 Fairford Swan Aid. All rights reserved.